...I've been slightly obsessed with Simply Lemonade with Mango. Seriously. I can't even keep any around long enough to snap a photo or figure out something fun to do with it. It's too good. Like, ridiculously. ...I've been reading the latest books from some of the series that I adore. The first being Buried in Buttercream (a Savannah Reid mystery from G.A. McKevett). And the second one which I just finished being Dolled Up for Murder (A Josie Prescott Antiques mystery from Jane K. Cleland). And I'm extremely antsy for the library to open today so that I can pick-up the new Sookie Stackhouse book Deadlocked. Sookie! ...I've found myself getting addicted to a few of the great new t.v. series from this past season. My fast-favorites were New Girl, Revenge, and Grimm. Why yes, I do have very eclectic tastes...why do you ask? ...I have a new obsession. It goes by the name of Baby Arugula. Small...tender...peppery and reminiscent of mustard greens. How I love thee. It all started with this salad, by the way. How else have I used it, you ask? Well. I'm gonna go ahead and get real for a minute and admit that I almost always have a few frozen pizzas in the freezer. Sometimes I just want easy. But the great thing about that is dressing them up. Oh yes. Get a cheese pizza and before you slide it into the oven, add some roasted garlic cloves, some artichoke hearts, and some salami....once you pull it out, put a big ol' handful of baby arugula on top, drizzle it with a dash of olive oil, and sprinkle on some dried chile flakes and oregano. That's the stuff, baby. Plus, I've also been throwing it into pretty much any kind of sandwich you can imagine. I'll be sharing one such sammich soon. Plus, it goes fantastic with grains...which I'll be sharing in a guest post coming up towards the end of next week. I'll give a heads up. ...I've also been contemplating getting a dog. I mean, I like dogs...but I'm a cat person. But I know the kids want a dog. I think I was just scarred by having to scoop so much poo as a kid. Tiny folding shovels hurling...ahem...projectiles over the fence and down the hill across an alley may or may not come to mind. Anyhoo. Bulldog. Pug. Something along those lines. I'm sure I'll be wavering on that for quite some time. You know...it mostly comes down to "potty training". Don't know if I'm ready for that. ...I tried Biscoff for the first time. It was odd. And addictive. And I enjoyed it. 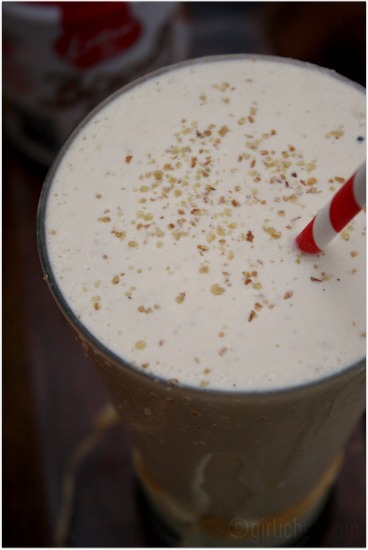 I even used it to make a Malted Biscoff Banana Milkshake. But now that my jar is empty, I won't be rushing out to buy another one. I kinda got over it. ...I've made some things that I know I'm not going to get around to blogging. BUT. Since they've already been blogged other places, I can still lead you to the recipes. One was this Beer BBQ Chicken of the crockpot variety. 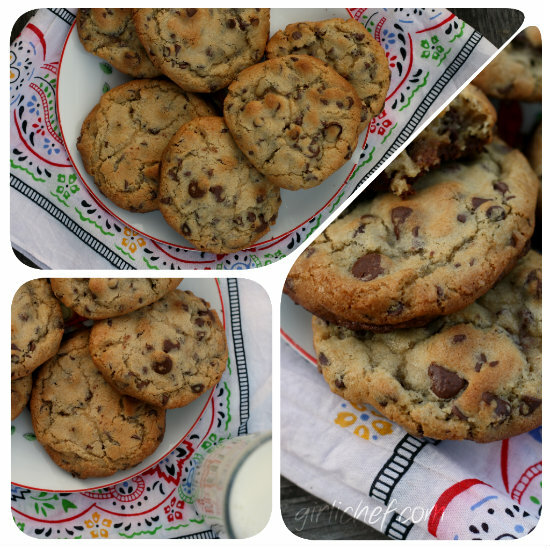 And another were these Chewy Chocolate Chip Cookies of the "made with coconut oil" variety. I'm also excited to try the chocolate chip cookies with coconut oil! Beer BBQ chicken sounds fantastic! And I've heard the biscoff hype and need to try it... not sure what I'd DO with it though. I've been loving the New Girl. Can't wait to try these recipes. Especially the cookies. I've got coconut oil I've been wanting to use. Love this post :) I'm really into arugula right now too. You know who else loves arugula? Giada. LOL! I had to throw that one in there. She has lots of recipes with arugula in her new book. I'm gonna have to check out that lemonade with mango. I gave up soda 2 months ago and I'm always looking for something different to drink. I love watching Revenge on Wednesday nights. So good! I'm going to a book signing on Saturday night to meet Charlaine Harris and get a signed copy of Deadlocked. Shhh!! Don't tell anyone. It's Derby Day here and I totally skipped out on all the Derby parties to go get my book signed. I think that makes me an official "book nerd." My kids drive me crazy for a dog all the time and I like dogs and all, but but I'm not having it...too much work. P.S. 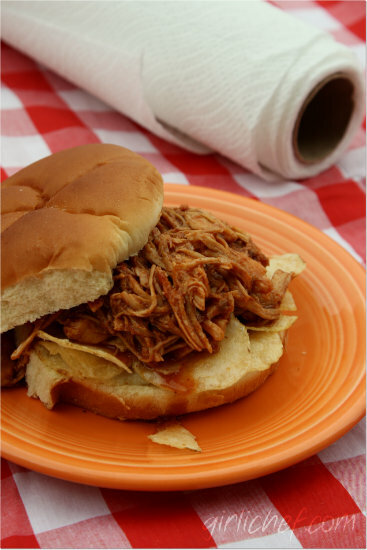 I love that crockpot bbq chicken. So easy. so good. I need to make it again. Great post. 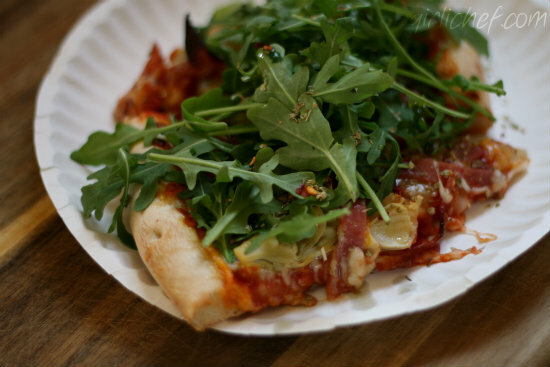 And I love the paper plate with the pizza topped with greens, yum. I finally made something I have been wanting to make forever (tlayuda) and am now obessed, had themforlunch,breakfast and even hadone at 2 am while I was packing up the last of my kitchen. so good, girl you have tobe the busiest blogger Iknow. You Rock!! I love New Girl also! kind of obsessed. That and Grey's. So glad you're on the MMM Arugula! team. It's the only way to go. And YES on Revenge. One of my biggest guilty pleasures! Oh, I haven't tried the Simply Orange w/ Mango...but now I will keep a look out for that. Anything mango and I'm SO there. How have I not heard of the simply lemonade with mango? Fresh mangos are everywhere in Beijing right now, and I've been a bit obsessed. I need this lemonade.